It's a 4" foam 12-sided die, with tentacles, Elder Signs, and Great Cthulhu himself. It's SQUISHY! 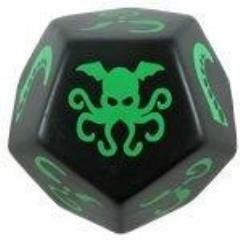 Giant Cthulhu Dice comes in four different colors. Instead of the glass beads that the original set used for Sanity, Giant Cthulhu Dice includes 18 "silly bands" in the shape of Great Cthulhu himself! Put them on your wrist, or your tentacle, or wherever you want. Go crazy! It's perfect for outdoors or for waiting in line. Keep Giant Cthulhu Dice in your backpack and drive your friends mad outdoors, waiting in line . . . It even floats, not that there's any way you can tell which side is up in the pool. But don't let that stop you! A 4" foam 12-sided die and 18 "silly bands" in the shape of Cthulhu, packaged in a plastic bag with cardboard header.